Posts tagged with "Croatian Kings"
After the civil war and Michael Krešimir II's twenty-year long reign, Držislav came to Croatian throne. Thanks to alliance and good relations to the Byzantine emperor Basil II Boulgaroktonos (the Bulgar-slayer), Držislav acquired jurisdiction over Dalmatia. There are two stone tablets preserved from his time from which we can see that there was a precise system of succession of government, however, a political split that had followed will have resulted in a dynastic disruption that would be resolved only 17 years later. Apart from the successful campaigns against the Hungarians and Bulgarians, where Tomislav had proven himself as an exceptionally good military strategist, his reign as a duke, and ultimately a king, was marked by two events that were important for the ecclesiastical history of Croatia. The events in question are two church councils in Split, in 925 and in 928. These events will be further discussed in this article. We will also mention Stjepan, Tomislav's heir, to whom he left a consolidated state, despite of a civil war that was going on at the time. The 20-year gap with no mention of any notable Croatian ruler is filled by Tomislav, who was Muncimir's successor. Although some historiographers insisted on including duke Višeslav in this period, their thesis had no proper arguments. 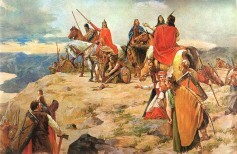 Tomislav's reign was marked with conflicts against the Hungarians and Bulgarians, in which he came out as a victor. After these conflicts, the previous duke was titled king (rex), and the Croatian duchy became a kingdom. In order to seize power, Branimir murdered Zdeslav in 879. With Pope's help, he liberated the country from political dependency of Byzantium, and Croatia was briefly connected to Dalmatian cities under the Byzantine government. Branimir is later succeeded by Muncimir, probably the youngest of Trpimir's sons, on the throne of a strong and independent Croatia. Apart from his involvement in the conflict concerning the takeover of government in Serbia, in a preserved inscription from his time he is also mentioned as a princeps.